Comments: This is a native shrub of the southwest. 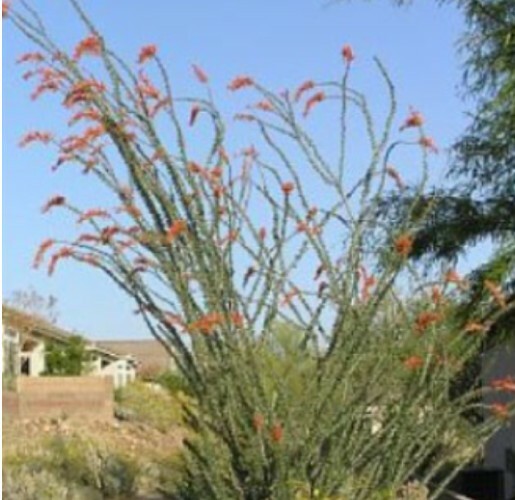 It produces tall ascending canes that are topped with tight clusters of bright orange, tubular flowers that attract hummingbirds and orioles. Stems are armed with thorns. It requires dry, sunny sites and is well suited for rock gardens and xeriscape developments where there is little water, This shrub is a striking specimen plant in dry landscapes, especially when in bloom. The plant itself can be quite handsome even without flowers because of the ascending stems arising from a tight crown.